Word-Beat combines the distinctive voice of Charles Williams with the driving rhythms of virtuoso drummer Tom Teasley. Word-Beat combines songs and chant with African-style rhythms for an energizing, spiritually uplifting effect. For the latest word on Word-Beat, visit Tom Teasley's web site. Their collaboration transcends form and culture, radiating a universal power and hope. This vibrant, energetic and eminently danceable music welcomes all listeners to celebrate while also offering food for thought and balm for the soul. ... as compelling a duo as has come this way in a long time. "The dynamic interplay of Charles Williams' compelling voice and Tom Teasley's tonal rhythms create a magic that takes possession of an audience. Combining an inspired choice of poetry, prose and song, with the intensity, charm and artistry of the two performers, WORD-BEAT leaves an indelible impression on your soul." 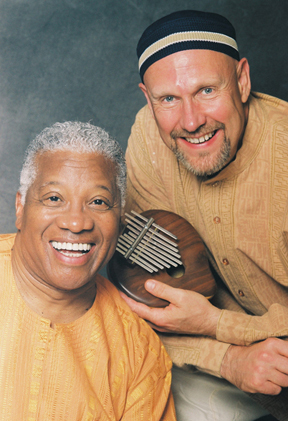 Singer Charles Williams and percussionist Tom Teasley have put together an excellent collection of multi-cultural poetry backed by a colorful array of percussion." The Soul Dances is a densely layered poly-rhythmic percussion jam with narration of inspirational wisdom nuggets, gospelized solo vocals and accompanying horns for textures.The Soul Dances is meant to be danced to and played back loud. Biblical fervor, African juju chants and Tibetan shamans battling demons mix it up with driving grooves, euphonium, didgeridoo, trombone and tenor sax. This is a real workout that liberally borrows from swamp gospel, Yoruban folk song, Whirling Dervish zikr and equivalent global influences. This is action music for parties and workouts. Prime the pump and laissez les bontemps roulez. ...there is something for everyone here, from thinker to drum head, to explorer.